Randy documents the removal of a basal cell carcinoma using black salve. Black salve- is a thick paste that is made from various native American herbs, with the main herbal component from the Sanguinaria canadensis plant, which is also known as bloodroot. The use of black salve is sometimes referred to as botanical surgery because of its ability to purge tumors and cancerous skin lesions from the body. The salve is used by applying it over an area of diagnosed or suspected malignancy, which will trigger an immune system response if there is cancerous tissue present at the location. Randall’s story: early in 2017, Randall noticed that he had a strange looking scab on the back of his leg that would not heal. A photo was taken and when it was enlarged it became obvious that he was dealing with a skin cancer. Since he is a member of a support group in which people are using black salve, he felt comfortable using salve for the removal process. The first step was to clean the area thoroughly. He did this with rubbing alcohol and a Q-Tip. He then exfoliated the area a bit and also used a sterile pin to lightly prick the area a few times. Doing both of these beforehand can help to get the salving process moving along and helps to ensure that you have a good reaction once the salve is applied. The area was sterilized a second time with rubbing alcohol before proceeding. The instructions say to stir the salve before use, a toothpick works very well for this. The salve was applied with just enough to cover to the edges of the lesion, once again a toothpick is the perfect tool for applying the salve to small areas. The salve was applied on 9/23/17 and then covered with a Band-aid that had a little coconut oil on it to prevent the scab from sticking. Note– some people prefer to remove the salve after 24 hours and let the eschar begin to form but it is also okay to leave the salve on and let it become part of the eschar. That is how he did it. Photo 2 reveals the reaction to the salve, this included pain and redness around the area. 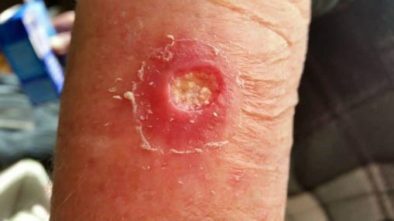 Note: although the skin may become reddened from the black salve, it is only when cancer present that you will see the formation of an eschar (or scab) that will slowly emerge and detach itself from the body. The bandage was changed daily. The wound was sprayed with Sovereign Silver (colloidal silver) on occasion and then a clean bandage was applied to protect the wound. Lots of activity was going on in photo 3 which was taken 4 days later. He reported that this was the most painful time of his journey with lots of redness and swelling. He also experienced a lot of drainage over the next 2 weeks, so changing the bandage daily became a necessity. Note: It is very important not to do anything to disturb the eschar during this time that might cause it to fall away prematurely as this would require starting the whole process over again. A bandage can help protect the wound from being disturbed. Photo 4, was taken on 10/13/18 right after the eschar fell away on its own and revealed a clean looking pink wound with no white matter left behind. Note: White matter would mean that there was still cancerous material in the area and this would require a second application of the salve. You can view an example of this white matter with this link. If a second application is needed, it is best to let the skin heal up a bit first as it is very painful to apply black salve to an open wound, and doing so would only cause unnecessary trauma to the area. Overall this was a very successful solution for this situation. Although he said that his pain was manageable and he was able to function normally with work and performing his daily activities, here is a list of some natural pain remedies that can be helpful to have on hand if you plan to use black salve.